Thanks to this feature you will be able to lock your app wholly or partly. The locked content will be accessible for authorized users only. We are going to see how to set up this feature. First, you have to add the Padlock feature to your app, click on from “Add pages” to add this feature to your app. Then you can set it up. 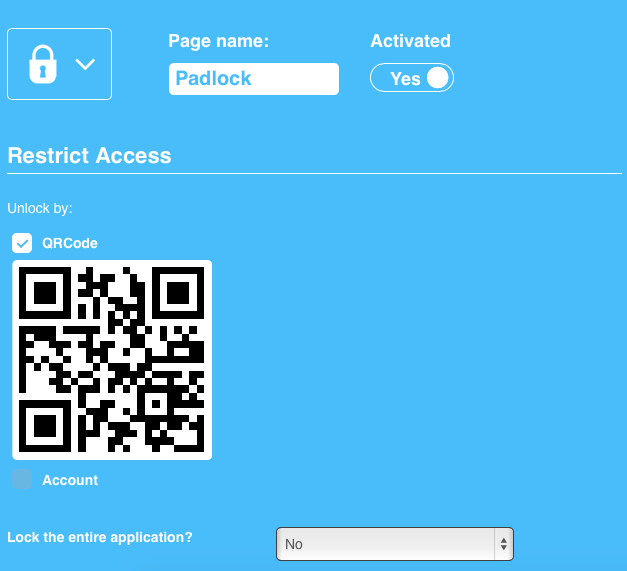 You have two possibilities to unlock the Padlock and grant access to the whole applications to registered users. The first one is to use a QR Code and the QR Code Scan, and the second one is to create an account for your users, or to let them create their own account. Of course you can use both at the same time if you want, it’s up to you. How to authorize the users. If you have chosen not to authorize all the registered users by default, you will have to authorize them manually from the “Users” menu, in the editor: Click on it. All the users who have created an account in your app, are listed. Click on to edit a user. If you want to authorize the user, all you have to do is to check the corresponding checkbox “This user can access the pages locked by the “locker” feature. Then click on “Ok”. A little warning regarding the publication of your app on the App Store. Before submitting an app, create a test user with authorized access. Then, when you publish your app on iTunes Connect just fill out these info in the user demo fields to let Apple reviews what is behind the padlock feature.